Our Homeware team have been busy. They’ve been working on releasing the Autumn Homeware collection and now that it’s out they’ve picked their favourites! The overall trend you see coming through from their Autumn Homeware picks are ‘Rich Colours’ – lot’s of navy blues! The Rich Colours Trend: Low-key tones have dominated for a while now, but it’s out with the lighter colours and in with deeper, rich colours. Add a deep red, green or blue bedspread for a warm and luxurious bedroom makeover. If you can’t part with your existing duvet, add in accents of rich colour with cushions and a matching floor rug. A fabric covered bedhead with gold or leather accessories throughout the rest of the room will complete the luxe look. You can read the full blog post on Key Homeware Trends for 2017 here. But before you do that, check out our picks below! The Prism Bean Bag: Karen’s pick! What is your favourite piece from our new range? And why? I’m a big fan of the Prism Bean Bag as it’s a modern take on the classic bean bag. It works in various rooms around the house, the bedroom or lounge and it comes in two beautiful neutral shades – I’m getting the dark blue! Bonus: the linen style of fabric gives your room some luxury too. They are beautiful textural and printed pieces that work well with a modern or classic kitchen. 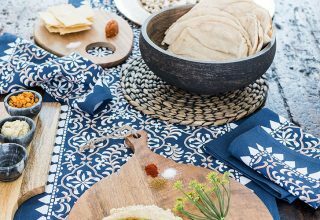 They also have a bohemian twist to normal classic kitchen linens. Most of all love the price points! But they look expensive with attention to detail – linen look frayed edge tablecloth, large tassels on table runner. Tuileries Duvet – It captures the key trends for new season; rich tones, watercolour and a beautiful floral silhouette. I love the Black & White Cotton Co-ords Duvet, a simple design with a huge statement. I’m in love with the Brooklyn Clothing Rack (out soon! ), my husband and I are currently looking for an apartment to buy in central Auckland and with space at a premium I know this piece of furniture will serve us two functions: practical and stylish. Do you have any favourites from our Autumn Homeware range? Let us know in the comments below.